The day finally came. After months and months of posting about the Harry Potter prequel/spin-off, Fantastic Beasts and Where to Find Them, I was finally sitting in the theater waiting for the famous Harry Potter score to start playing. I was so excited. I was in a room full of HP fans all waiting for this moment. We got there early, we sat in those movie theater seats for FOREVER, we watched ridiculous commercials, we idly passed the time by answering the trivia questions in our heads, we sat though 25 minutes of previews, and then…the music started. And we were all back. Back in our Harry Potter happy places. Fantastic Beasts starts with Newt Scamander, played by Eddie Redmayne, passing through customs into New York. He carries a beat-up, brown suitcase that has a tendency to try to open all on its own. Why is it trying to open? Because it is full of magical creatures that would love a chance to roam NYC. Our first magical creature to escape is a niffler with a love of all things shiny. From the moment of the first escape, we see that Mr. Scamander is going to have quite the time on his hands trying to keep his magical creatures contained and not destroying New York. Luckily for him, he finds some help along the way in the form a of a no-maj (muggle), a disgraced ex-Auror, and a lovable Legilimens (mind-reader). Not so lucky for him that the ex-Auror, Tina Goldstein, wants to use him and his magical creature contraband as her way back into the good graces of the President of MACUSA. The film follows the antics of these characters as they are all chasing one thing or another. Scamander is chasing his creatures, Tina is chasing Scamander, Jacob Kowalski (the no-maj) is chasing this magical world he stumbled into, and Queenie (the mind-reader and Tina’s sister) is chasing love. There is also plenty of action going on parallel to the chase of the magical creatures. A dark force has been terrorizing NYC and the MACUSA is determined to stop it before it risks exposure and causes war between the wizarding world and the non-magical world. 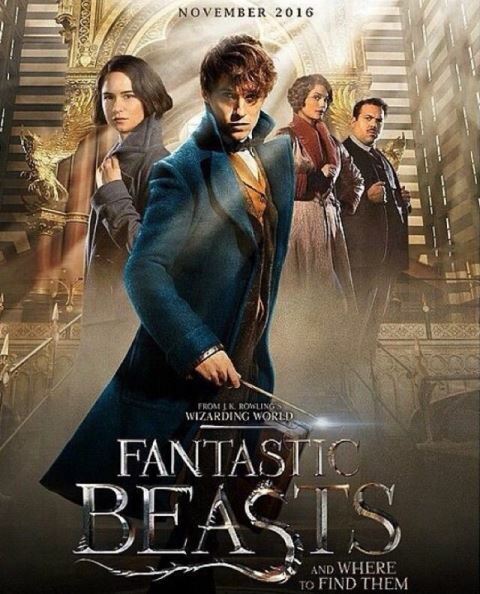 Due to some unfortunate timing, Scamander and his creatures are accused of being behind the dark force. So while trying to re-capture his creatures, he must now try to prove not only the innocence of himself but also of his creatures. There are so many high points to this film but the biggest one for me is that I did not sit in that theater for 2+ hours wishing that Harry, Ron, and Hermione would show up. I was in their world but I felt separated. I was so engrossed in the story of Newt Scamander that I did not find my mind wandering. This is not a Harry Potter film in the traditional sense. This film is simply set in the same world. There are plenty of familiarities and even some name-dropping that HP fans will appreciate, but that’s it. You aren’t sitting there waiting for Voldemort to rear his ugly head or for Hogwarts to become the main setting. Fantastic Beasts explores what life for wizards was like outside of London. I really appreciated that this film was able to stand in its own light. Some other great positives of the film were the storyline, the special affects, and the action. The storyline was smooth. It didn’t feel forced. There is a reason why fans demand that J.K. Rowling is the only one to tell a HP story. It would not be the same if someone else came in to this world and tried to siphon out a story. Rowling knows the world of HP and we believe her when she tells us what happens there. The special affects were great. The action scenes were able to be loud and in your face. I found myself jumping back in my seat a couple of times. It matched the action of the last couple of HP films, where the storyline was a little bit darker. Although, I did not find that Fantastic Beasts went nearly as dark as Deathly Hallows. It stayed much lighter, which is a surprise considering that the storyline is pretty dark. Sidenote: That execution scene was so good. Perfect illustration of contrast. A white room with a cheery attendant showing you all of your best memories right before she puts you to death? Perfect! Now you guys know that I love HP so I don’t think I am capable of giving a truly un-biased review. I was just happy to be back in a theater waiting to dive in the wizarding world. But even I can find a couple of things to criticize. First, Eddie Redmayne is awkward. No way around it. Luckily, it fits the character to a degree but that’s just a lucky break because Redmayne is just an awkward guy to watch on screen. It does translate into adorably awkward in many ways but there is no denying the awkwardness. My only other criticism is that the film did not leave much open for figuring out what the next four films could possibly be about. We know that Scamander is working on his manuscript and we can assume he will try to capture more creatures but outside of a reference to a mysterious woman, that’s about it. And we can assume we will be seeing more of Gellert Grindelwald thanks to a surprise cameo. But I need more to go on! I mean, can’t we at least get an after-the-credits scene?!? Haven’t we earned that?!? Apparently not. So overall, I enjoyed this film. I loved being back in that world but I really loved that I was in it in such a new way. New setting, new characters, new storyline but plenty of references that make sure no one forgets where they are. And now begins the counting the days until the next film. Have you seen Fantastic Beasts? If so, what did you think? If you haven’t seen it, what are you waiting for? This entry was posted in Dani, Reviews: MOVIES and tagged Dani, fantastic beasts and where to find them, Movie Review, Movies. Bookmark the permalink.